The combined version of this activity is made up of different kinds of competitions: Agility and Jumping. WARNING! 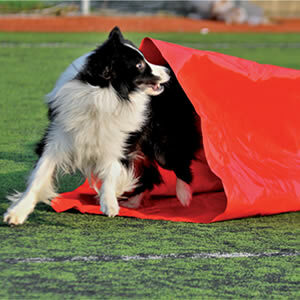 we are modifying some parts of the Agility regulation shortly the registrations will be reopened. For regulations refer to FCI. Junior and senior categories compete together. The following heights: 30cm, 40cm, 60cm correspond to SMALL, MEDIUM, LARGE categories respectively. Individual qualifiers: The following will qualify for the final on Sunday the 23rd of September: the first 8 large category duos, the first 4 in the medium and the first 4 in the small categories of the AGILITY activities; the first 8 large category duos, the first 4 in the medium and the first 4 in the small categories of JUMPING; the first 8 large category duos, the first 4 in the medium and the first 4 in the small categories of the COMBINED, from the qualifiers on Friday the 21rd of September. ELIMINATION OVER MORE ROUNDS WILL TAKE PLACE STARTING FROM THE AGILITY+JUMPING, FOLLOWED BY AGILITY, AND JUMPING LAST. The following will qualify for the final: the first 8 large category duos, the first 4 in the medium and the first 4 in the small categories of the JUMPING activities from the qualifiers of Saturday the 22nd of September. Team qualifiers phase: The following will qualify for the final on Sunday the 23rd of September: the first 6 large category duos, the first 4 in the medium and the first 4 in the small categories of the COMBINED competitions of Friday the 21st of September, which are also valid for the individual competitions by adding up the 3 best scores out of 4 duos.